Here’s a simple reminder—a negotiating tip: bargaining is not negotiating. Sure, it seems obvious and it’s not a difficult concept to get. Yet, it’s almost instinctive to think that negotiating means compromise. We’re conditioned from birth to compromise, to believe that compromise is always best, and that negotiation is compromise. 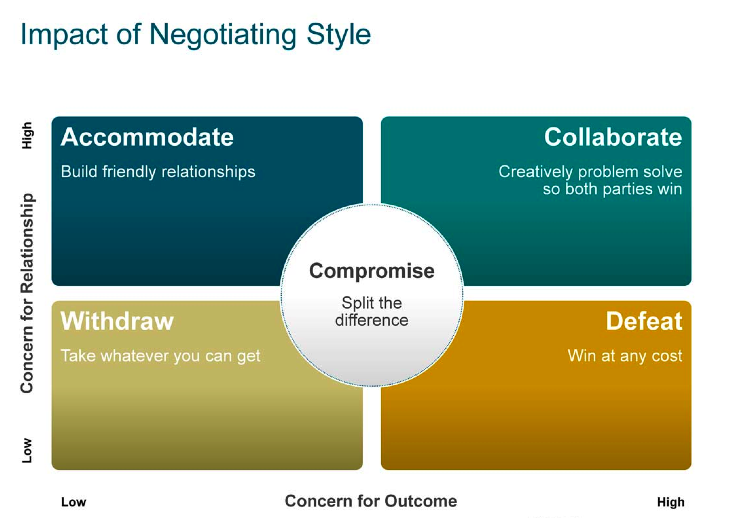 Compromise has its place, but it is not what negotiation is all about. As adults, there’s a strong inertia towards negotiating the same way. Each side puts what they have on the table and then split it in half. That’s what encourages us to bargain. And bargaining is not negotiating. One of the biggest problems with bargaining and compromising too early in a negotiation (say, for example, at the beginning of it) is that it avoids more creative solutions that might well have satisfied both parties fully. Compromise assumes that one party’s satisfaction must come at the expense of the other party’s satisfaction. But there’s no reason to jump to that assumption—in fact it’s often incorrect. One definition we like to give to define “a good compromise” is a solution that dissatisfies both parties equally. Why should either party be dissatisfied? Why not look for a more collaborative solution? Indeed, finding the solution most likely to satisfy both parties most fully all but requires at least some investigation. It will nearly always be a solution that was not apparent at the beginning of the negotiation. Compromise and bargaining has its place. But that place is not at the beginning of a negotiation. One thing that can help avoid the pull towards compromising too early in a negotiation is to make compromise a conscious choice. By making the decision to compromise a conscious choice, you avoid the knee-jerk tendency to go there by default and you avoid starting the negotiation with compromise. Doing so puts compromise back in its place—one tool, of many, in the negotiator’s belt. Tension in Conflict Management: Pay Attention! The groundbreaking work of Harvard’s Program on Negotiation, and the classic best-seller, Getting to Yes (Fisher, Ury, Patton), has successfully reframed the conversation on negotiation from adversarial and tactical based arguing to ‘win-win’ problem solving. Almost everyone nods their head in agreement on the desire for win-win. And yet, even casual observation demonstrates that we often don’t behave in a way likely to produce ‘win-win’ outcomes. Every day, negotiators miss opportunities to achieve the success they could have had…and the problem isn’t what they think it is. They settled for less than optimal outcomes because they weren’t paying attention to the most critical ingredient to negotiating a ‘win-win’. They probably don’t know what it is…and even if they did…they wouldn’t know what to do about it. When the tension rises between your counter-party’s and your interests, splitting the difference is a quick way to relieve the tension…but it is rarely the best solution. 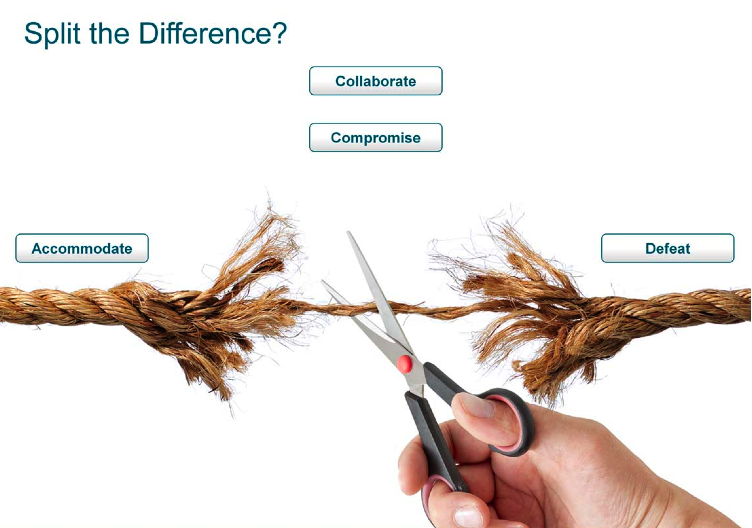 For better results we need to gracefully manage the tension to work toward collaborate. The goal is win-win and split the difference is lose-lose. True, nobody loses big and there is relative peace, but nobody wins either. Sometimes it really is fixed pie and perhaps split the difference is necessary. However we must be slower to split the difference in case there is a possibility to generate a better alternative for both sides. Wouldn’t it be great to have a way to discover the level of tension and maintain the productive zone wherever possible? Our negotiation skills training courses help participants learn to “stay with the tension” to optimize win-win outcomes and how to use Principled Persuasion to recognize a counter-party's legitimate needs and aspirations while pursuing her own interests with energy and determination. Recognizing and using these components will give you better outcomes. In this video, Joe Friedman briefly summarizes these three components of negotiation and how they can help improve your negotiation skills. One big takeaway from ZEHREN♦FRIEDMAN Negotiaton Skills Training is that negotiating is a process. Even if you just recognize that fact and use that process in every negotiation you face, you will get better outcomes. What changes from negotiation to negotiation is how much time you spend on any one part of the negotiation process. One common mistake people make is to think a negotiation begins by putting something on the table and bargaining about it. But that's already halfway through the negotiation process. The biggest stage in the negotiation process where mistakes are made is… planning. Some people don’t have any negotiating process that they use—They act a certain way and they expect you to react a certain way. And even within the process, negotiating behaviors add a layer of complexity to the negotiation. So, negotiating behaviors is the second major component of a negotiation. Sometimes it’s not possible to grow the pie any bigger, it’s not possible to serve both parties, nor maximize the outcome. In those situations, you must know how to play the game. It’s important to know how to play the game even within the context of the negotiating process. Playing the game includes tactical negotiation. Given that tactics exist to pry concessions away, it’s also important to know how to give things up. Knowing how to play the game can be a useful part of the negotiation process and becomes even more essential where mutually ideal outcomes are not available. Do your sales reps make unnecessary price concessions? Skilled sales negotiators close more profitable deals and build better, longer lasting customer relationships at the same time. If your salespeople are really good, even modest improvements to the top-line can make a big difference to the bottom-line. Is Negotiating Worth the Effort? Now add a modest 1% to sales revenue as a result of better negotiating, making it $101. If the negotiating is skillful and graceful, the 1% higher price won’t cause a loss of sales. Other expenses remain the same and the extra dollar of revenue falls straight to the bottom line. Now we have $133 of Net Income, and increase of 8.3%! If you can negotiate, on average, a 2% higher price, Net Income soars to 16.6%! Here’s some good news: Skilled sales negotiators close more profitable deals and build better, longer lasting customer relationships at the same time. I recently returned from a business trip to Shanghai. While I was awestruck by its size (25 million people), modern look (75% of the world’s construction cranes are in action there), traffic (I’ll never complain about Chicago’s rush hour again) and friendly people, I re-learned how to negotiate. Our firm has taught negotiation skills classes to professionals for over 20 years and I was in Shanghai to teach an advanced negotiation seminar to a client’s China sourcing representatives. I arrived a day early in order to acclimate, and didn’t return home until the following Saturday. I got two opportunities to visit several markets, where just about any consumer product could be procured. The markets were filled with locals and foreigners alike, all searching for bargains. My wife had asked me to find a particular bag, although I learned that the Chinese government had cracked down on the famous “back rooms” where “designer” handbags could be found. The rap revolves around a calculator, where the first offer is made by the merchant. “This would be your price.” However the number is always quickly erased, another number is punched in and you are told, “This is best friend price.” How did we get so close so fast? Anyway, I was offered the “your price” of 1,500 RMB (about $240), followed by the “best friend price” of 980 RMB (about $156). In negotiating, if you can live with the outcome or you’re thrilled (or anything in-between) you’ve taken part in a successful negotiation. I brought home a bag and a wallet and my wife is thrilled. However, if the authentic looking, feeling and writing Mont Blanc pen I bought for just under $3 is any indication, I probably got hosed! Be a Better Negotiator: Act Dumb! Acting dumb might be a smart thing to do. Acting dumb is important whether you are negotiating as a creative problem-solver or as a bargainer. In a Business Week article we explained that acting dumb requires asking a lot of questions, avoiding assumption-making, and confessing ignorance or confusion in order to draw from the other party a more detailed understanding of their situation, their goals, and their restrictions. Most negotiators fail to fully uncover underlying needs. Only 38% of sales reps and managers we’ve seen succeed in uncovering real needs. We’ve conducted consultations and seminars with dozens of companies that have sophisticated sales forces selling everything from high-tech electronics to water pipe to exotic foreign currency derivatives. After some guidance and practice that success rate can double to 76%. Not as easy as it looks. We’ve analyzed hundreds of negotiations. Two-thirds of the negotiators produce solutions that are not as good as they could have been (1/3 produce solutions that are not good at all). In our seminars we take pleasure in the challenge to convert those lagging bargainers into accomplished negotiators. Here’s a brief overview and introduction to the skills necessary for successful negotiations. The ultimate objective of these sessions is to help you negotiate as effectively as possible. ZEHREN♦FRIEDMAN has been helping clients sell, present, negotiate and influence more effectively on a global basis for over 20 years.